Punching bags for boxing come in a variety of sizes, materials and colors. Heavier bags provide more resistance -- the heavier the bag, the more difficult your workout. When it comes to choosing the right bag, size, level of fitness and the intensity you plan to train at all factor into your selection. Safety is another consideration since heavy punching bags must be secured to a stable beam or a floor stand so they don't fall during your workout. Inflatable punching bags and 2½-foot punching bags are ideal for children. Both 2½- and 3-foot bags are appropriate for small spaces and light training sessions, while the 3-foot bag is suited for beginner women boxers. The versatile 4-foot bag is appropriate for both women and men, and the 5-foot bag is the most common size. Bigger 6-foot bags provide extra resistance, plus the longer length means you have a wider range of targets to attack. Lighter bags in the range of 25 to 40 pounds help improve your precision and speed. A 40-pound bag is appropriate for a light hitter. Or you can choose a heavy bag that is approximately half your body weight for resistance training -- add weight if you're in shape and subtract it if you're out of shape. Heavier bags sway less than lighter bags. Ideally, the bag sways a little when hit, but if it swings too much, it hinders your ability to practice landing kicks and punches. 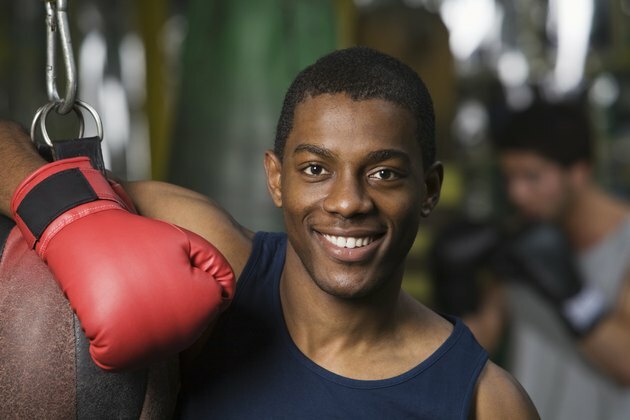 A male who punches harder might require a 60- or 70-pound bag. Bags that weigh 100 pounds are designed for boxers who are heavy hitters. Some punching bags are filled with water, which allows you to choose the weight by filling them to the desired level. To practice kicking along with punching, choose a standing bag. These bags include foam lower to the base, which means you won't hurt your foot kicking it. The rest of the bag is filled with water or sand to a weight of about 270 pounds. Jumbo bags are ideal for workouts with more than one person. Two to three people can hit a jumbo-size bag at once as it is twice as wide as a regular bag.